Although we tend to think of corporate occasions as indoor affairs, many companies need customized outerwear, so we provide. Our custom ladies jackets include Eddie Bauer logo womens coats as well as Port Authority logo coats, and always endeavor to give a range of beautiful options so ladies can feel great on the slopes, in the woods or at the lake. Features Self-fabric mock collar with a double welt half-zip placket provides a professional polished appearance. This stylish heather Shoreline is the perfect layer for the golf course or the office. 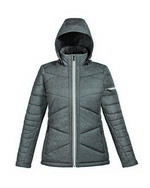 Our promotional North End blue ladies Avant tech melange jacket has a thermal retention shock cord at hood and hem. The branded North End blue ladies skyscape jacket features a tailored back vent at hem. The branded North End blue ladies uptown jacket has a center front zipper with metal zipper pulls. 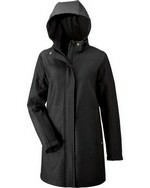 Our promotional North End ladies 3-layer soft shell jacket has a reverse coil center front zipper. Our North End Ladies Edge Soft Shell Jacket Folded Collar features polyster construction and your custom logo to create impressive corporate giveaways. The branded North End ladies endurance lightweight jacket has inside storm placket with chin guard. The Customizable North End Ladies Engage Interactive Insulated Vest protects against weather and creates an eyecatching item for promotional gifts. The branded North End ladies fleece bonded performance jacket has a lower front contrast reversed coil zippered pockets with garages. Our promotional North End ladies fleece bonded technical jacket features water repellent zippered front pockets. The Ladies' Crystal Mountain Jacket is an ideal giveaway at tourist spots, camping grounds, and hiking trails.